The Studio is situated alongside our house, with private access from the front and a pleasant shared garden and patio. 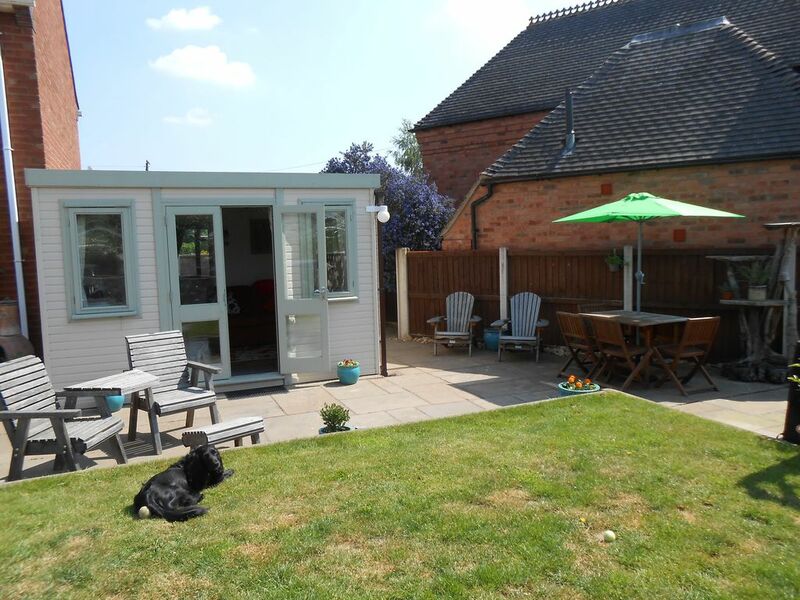 With countryside walks from the door, and easy access to many of the attractions of the Midlands, it is a great base for all sorts of activities. Comprising of a living room with sofa, table & chairs, wi-fi and tv, a kitchen area with kettle, toaster, microwave and fridge freezer, a bedroom with a comfy double bed and an en-suite shower room with wc & sink. There is a hospitality tray provided with tea, coffee, hot chocolate and biscuits, and fresh milk of your choice is waiting in the fridge on arrival. There are plenty of eating places within a few miles, as well as attractions such as the Severn Valley Railway, West Midlands Safari Park, Cadbury's World, Dudley Zoo, Go Ape, Bewdley Georgian town, Bridgnorth, Birmingham, Telford and more. A lovely area for walking, or just relaxing in the shared garden with table & chairs. As this is a hamlet, there are no local facilities, such as shops, pubs, churches etc, but you can reach all of these within ten minutes by car or half an hour's walk. I am a home loving person who likes to meet new people and share our lovely countryside home. I enjoy walking Bramble, our cocker spaniel. In the summer, I like to read a book in the garden, with a glass of wine to hand. I often have my young granddaughters to stay. The Studio is a great place to relax and spread out, with the added bonus of simple cooking facilities, a fridge and a freezer. You can come and go as you please, and enjoy all the attractions of the area. Ideal for workers too, as you don't have the expense of eating out every night. For the price of a room, you get a whole small house! With fields behind the property, it is a little rural retreat, but only 5 minutes from the town. Wi-fi, fibre, but slower due to countryside location. Salt & pepper. Other basics such as oil can be requested. The studio was just what we wanted for our week exploring the west midlands. We loved the fact that we were self contained but the hosts were friendly and on hand if required. The studio is furnished to a high standard and spotlessly clean. The shower was really powerful, comfortable bedroom with good quality towels and linens. Lovely little touches of box of tissues, pictures and wall hangings and amazing tea tray with huge range of goodies. Fabulous to have a great quality radio and free wifi. We visited Black Country Museum, Kinver Rock Houses, Cadbury World, Birmingham canals and Jewellery Centre. Fantastic Museums in Birmingham within an hour's drive. The village is surrounded by beautiful countryside ideal for walking. Severn Valley Railway, West Midland Safari Park, Cadbury's World, Bewdley Georgian riverside town, River Severn walks, lots of local countryside to explore.